Since 1963 BIPAC has stood at the intersection of issues and elections, directing business leaders to the people who can support their priorities and the path to resolution. Founded as an independent, bipartisan group to serve as the political action arm of American business and industry. BIPAC enables more effective business participation in the political process. They provide the political strategy, and tools, to help companies reach their election and public policy goals. The Colorado Prosperity Project is a collaborative effort between BIPAC and the The Colorado Chamber. It’s designed to aid the communication between employers and employees about candidates, issues and elections. BIPAC provides internet-intranet tools and content that is unique, easy to use, and the depth of the information available is unmatched. The Colorado Prosperity Project additionally offers ongoing guidance on strategy that can help your company’s grassroots program become more effective and efficient. The Colorado Chamber of Commerce Executives (CCCE) Mission is to be a relevant resource to Colorado Chambers, providing education, advocacy and professional development. To join CCCE, please download the CCCE dues schedule, fill it out and send it, along with payment for the appropriate dues amount, to CCCE, 1600 Broadway, Suite 1000, Denver CO 80202-4935. The CCCE dues are based on a calendar-year membership. The Colorado Chamber is the state affiliate for the National Association of Manufacturers (NAM) and many members are also members of NAM based on common goals. We are a strong advocate for growing and maintaining the manufacturing industry in Colorado – a vital sector of the state’s economy – and, thus, created the Colorado Manufacturing Initiative (CMI) in 2011. CMI works to foster communication and collaboration between manufacturers and the broader business community and promotes actions and policies which create a friendly manufacturing environment in Colorado. To accomplish these objectives, CMI works closely with NAM on programs, policies, and ideas. 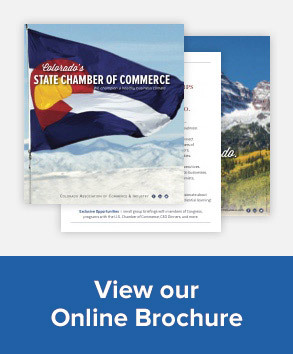 The Colorado Chamber is a member of the US Chamber of Commerce. Many members and local chambers are also members of the US Chamber of Commerce. We work closely with the US Chamber of Commerce on federal issues that are important to Colorado’s business community.